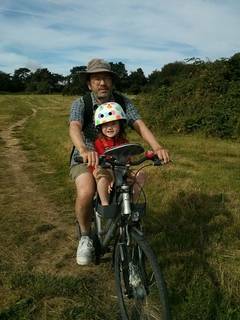 Four years ago I posted here looking at moving-child-by-bike options, but I never followed that up. I ended up with a Wee-Ride centre-mounted seat, which I've been really happy with over the last three and a half years. The Wee-Ride seat is easy to take on and off, and doesn't take up much space inside the house. Getting Helen into the seat is relatively easy, because the seat is close to the centre of gravity of the bike (and the frame-lock on my bike helps here). It's easy to talk to her, and because she is so close I gets immediate feedback on whether she's fallen asleep. (The headrest works ok when she falls asleep, though she tends to lurch sideways onto one of my forearms, which can make indicating difficult). 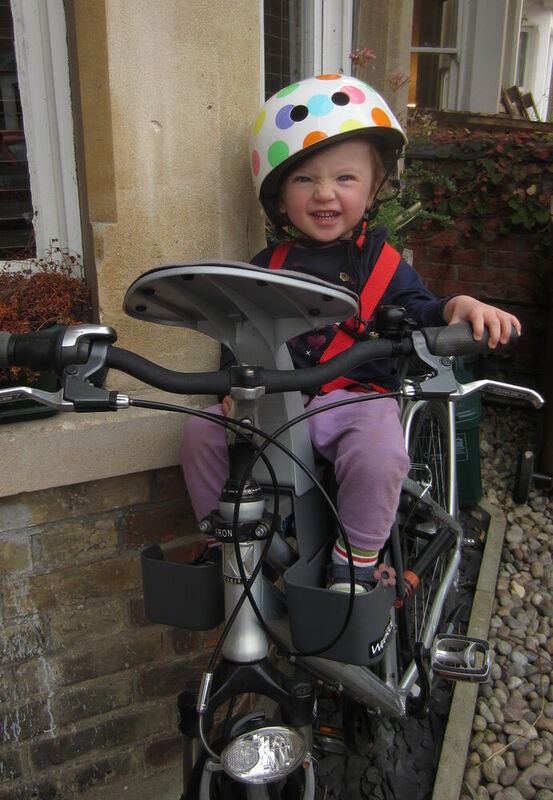 The only downsides are that cycling with the Wee-Ride does require a slight splaying of the legs to stop one's knees hitting the bottom of the seat, and that the fixed mounting bar stops step-over mounting even without the seat fitted. Camilla tried the WeeRide first, but didn't like it: she had more trouble with her knees. She has used a rear-mounted seat instead. I'm having trouble finding a successor to the WeeRide. A bigger rear-mounted seat would only postpone the problem for a little while. A trailer would be a pain to store and manage, and park around town. 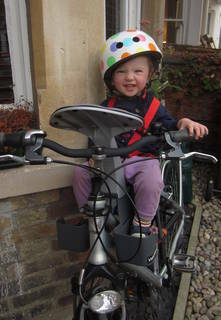 And cycling by herself (some of her friends are already cycling quite competently, so I have no doubt she could learn to do it quickly enough) is only going to be feasible on a limited range of local routes. Getting into and around town involves some terrible cycling conditions (I do occasionally see (accompanied) six year olds cycling on Broad St, or around the Plain, but so occasionally it's noteworthy). Even getting to a playdate in the Lye Valley involves stretches of the Hollow Way that are simply not safe for small children. So I had made up my mind that a tag-along was the way to go, and even worked out that I was prepared to pay for one of the more expensive ones, a Burley or Roland that fits to a pannier rack and pivots vertically. But my bike has a fixed (welded) pannier rack, so I can't attach one of these . And even the post-mounted ones won't work because my seat post is too short (even if I replace the suspension post). Engineering might be a possibility here, but the mounting plates for the tag-alongs are expensive and the people in the bike shops I've talked to don't want to do it. Getting a new bike would be a reluctant (and expensive!) option, as I'm very happy with my current one. But I can't actually find a suitable bike! I'm an everyday cyclist who does the very occasional longer recreational ride, so what I want is a city bike like my current bike: dynamo and lights, 8 speed hub gear, built-in frame lock, front suspension, mudguard, kickstand, pannier racks, etc. Almost the only thing sold in the UK that fits those criteria seems to be the Gazelles, but looking at those in Walton St Cycles they have the same problem my bike has: their pannier racks, though not actually welded in place, are necessary to hold up the rear mudguard. So now I'm looking at a Follow-Me, which allows attachment of a child's bike onto the back of an adult bike. Of course the real solution is to provide Oxford with infrastructure that makes it safe for 8 year olds, or accompanied 6 year olds, to cycle anywhere. The rate we're progressing with that, I have doubts about this being an option for my grandchildren.